Further down the coast from Suez you will find the seaside town of Hurghada which 20 years ago was little more than a minor fishing village. 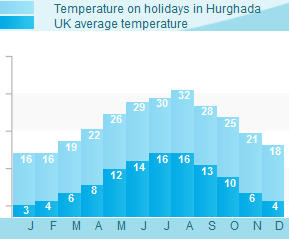 All inclusive Hurghada holidays are now in a choice destination whose main income is motivated by tourist traffic. The town is growing with the planning of new luxury hotels encouraging shops and restaurants to open nearby. You can also catch a ferry to Sharm-el-Sheikh on all inclusive 2019 / 2020 packages in Hurghada , another popular tourist development on the Sinai Peninsula. Highly recommended activities including scuba diving and snorkelling where the dive centres there are will cater for all your water sports needs. For something a little different on holidays in Hurghada why not take a submarine tour from Sinbad Village where you can spot the colourful fish and pink coral along the sea bed. There are other less energetic water related activities on offer as well. There is an aquarium in Hurghada town open daily from 9am to 11pm as well as the Marine Museum further north four miles away from Hurghada. There are also other popular destinations in Egypt . El-Gouna is a chilled out little resort which is decorated with Nubian architecture. It is steadily growing as a popular tourist spot and is not yet overrun with holidaymakers so it is best to visit it before the cat is out of the bag. Soma Bay is 28 miles south of Hurghada and also increasing in size to accommodate the demand for all inclusive holidays Hurghada there. It has its own golf course and marina as well as two authentic Roman quarries.